The Hearts & Kisses Bouquet combines vibrant hues of peach, orange and green to create a gorgeous collection of flowers. Handpicked roses, spider mums, lilies, carnations, pittosporum and salal are artfully arranged, each perfectly complementing the other. 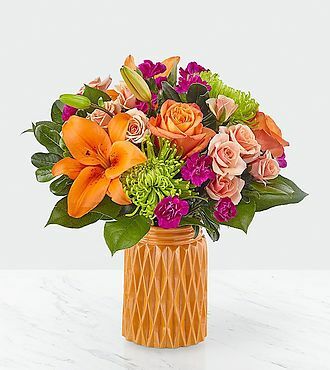 This bouquet is perfect for any occasion, sure to both impress and entrance its recipient. STANDARD bouquet is approx. 13H x 13W. DELUXE bouquet is approx. 14H x 13W. PREMIUM bouquet is approx. 14H x 14W. "My mom received her birthday flowers three hours after I ordered them. What great customer service, I will definitely do business with you again and refer your company to others." -- Tina T.